I’m Bajan, Irish, English, Guyanese, some other stuff with about 1/16 a$$hole mixed in. At the bottom of the barrel of my a$$holery, is my propensity to keep my sunglasses on a little bit longer than 35% of the population. I keep them on while riding the train, occasionally when shopping, at outdoor cafes or restaurants (so long as half the party I am with is doing so – a table worth of sungla$$holes is a little much. Two girls can get away with it though). While riding the train, especially in the morning, it’s an extra layer of protection and separation from others. I cherish that extra bit of time and ability to block out the masses, particularly when I am in the I “hate” everyone mood. It’s also nice when I want to nap, since I do tend to sleep with my eyes partially open (so says Husband). Sunglasses hide the welling up of tears nicely too. Lastly, it’s the best way to freely and recklessly eyeball people without being caught. I think that is the biggest reason, aside from blocking out the sun from my lasik’d eyes, that I love sunglasses. I love being able to swing my big dark browns any which way. Bring on the reckless abandon! From the minute to the monumental, watching each other is so entertaining. Being able to sample from the buffet of real-time nonfiction is an all-you-can-eat extravaganza. I never seem to fill. 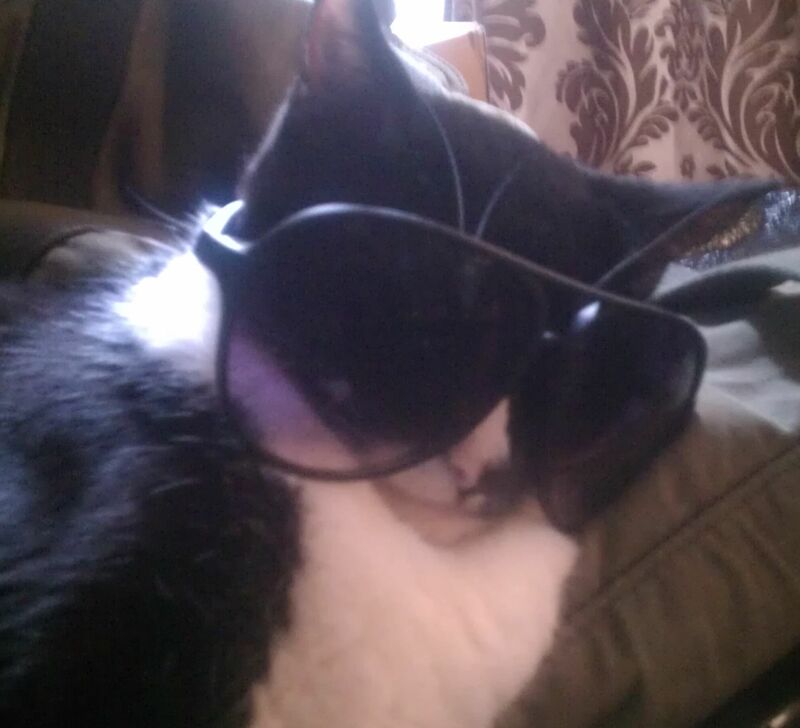 But, I like being able to plug in and out of the matrix willy nilly and I feel that ability is enhanced by my shades. I must impart that I am not someone who walks around indoors for more than 1min 30secs w/my sunglasses on. I do not slap them on inside my office and wear them for quite some time before heading outside. I can count on one hand how many times I’ve made it through an entire conversation whilst shaded and the other party wasn’t. On the other hand, if I don’t know you, don’t want to know you, or you’re creepy…my shades are not coming up. Which leads me to say that sunglasses assist people, particularly women, with avoiding catcalls and other employed methods to garner our attention. It helps with maintaining the facade that you did not notice the attempt to woo you, masking disgust at the attempt or the romeo and it can aid you in being unobserved while dodging your eyes around to assess the situation. This entry was posted in Thoughts and tagged Conduct, Sunglasses. ← Choose Your Own Adventure Poll – What Do You Want?